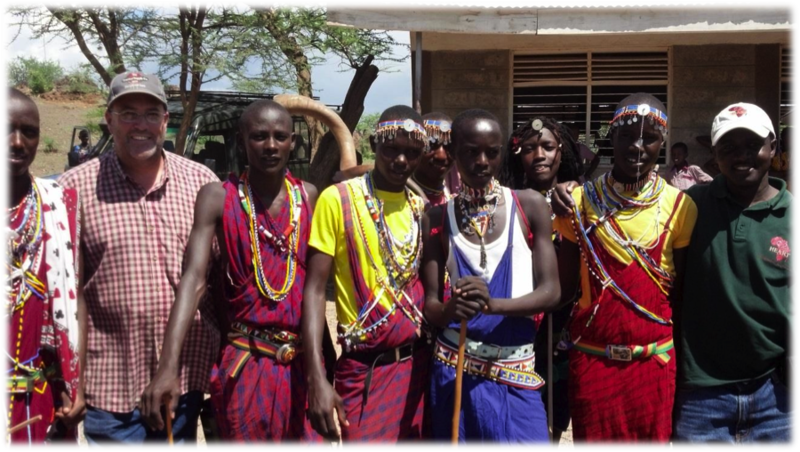 First and foremost, thank you for all your prayers and financial commitment in support of my recent mission trip to Kenya. It was quite an experience. Long distance airplane travel isn’t all it is cracked up to be. I am glad I didn’t have to take a China Clipper. I have a whole new appreciation for those who crossed the big water in slower airplanes. 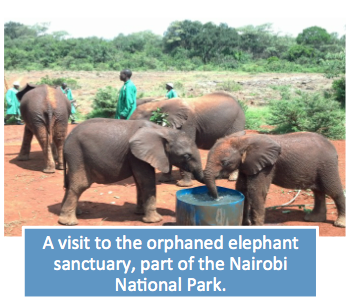 Dateline-Nairobi, We arrived in Nairobi at about 1:30 am on November 2nd. 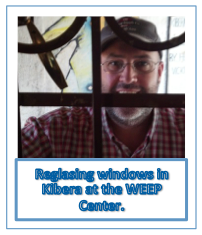 After a short nights sleep we were busy making plans for all the upcoming work for the next month there in Nairobi and in Kisii ( about a six hour drive west of Nairobi). The first Sunday we visited Dandora where Bayside has been doing great things for the Dandora Baptist Church and local education and medical clinic. We attended services, handed out goodies for all the kids and had lunch with the pastor and church elders. It was good to see all that Bayside has done and still realize it is only a small dent in what can be done. A couple of years ago the church was just a shell with a dirt floor that they had been working on for about fifteen years. Now it is nearly complete with a nice new terrazzo floor, stained glass windows, and plastered walls. Quite an upgrade from the tin building they had been meeting in just across the courtyard for years. What an accomplishment. With the exception of a couple of trips to town, to see a kitchen project the contractor had just finished, and shopping for commercial kitchen equipment, the first week was a lot of demolition work on the existing building and preparing for all the new utilities, doors, windows, and counters. The building was made of solid quarry stone and concrete. So, everything in the way of utility access had to be chiseled, drilled, and hammered out of stone and concrete. That is just how it is done in Kenya. Even in downtown Nairobi on multi-story buildings, people were chiseling rock. The team finally broke down and bought a hammer drill on about the third day. 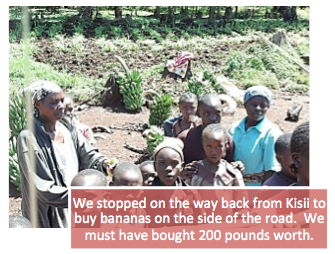 We left it in Kenya in well used condition. Probably my favorite trip out of town was our first. After a week of work on the kitchen we reached a point, where we were waiting on other people to finish their work. 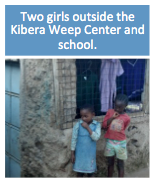 We visited the school at Oldonyonyokie, about three hours south. Amazing how 430 kids showed up each day out of the middle of nowhere. If you looked all around the school all you saw was Kenyan bush. We taught the boys how to paint Not all the paint made it on the walls. Some on the floors, some on the kids, and some on us. But they had apparently never painted before. Some of the kids had probably never seen a white person before as we were quite the attraction. When we were done, they served us a traditional Kenyan lunch of goat stew over rice with cooked cabbage and chapatti (a Kenyan tortilla). After lunch we toured the school and were surprised to see they had a solar powered computer lab. We were at least ten miles from the nearest electrical service but they were set up with technology (Dell Computers). Just before we left, the dance troop did a traditional Maasai folk dance for us. They won first place in provincial competition this year. They just need matching costumes to compete at the national level. 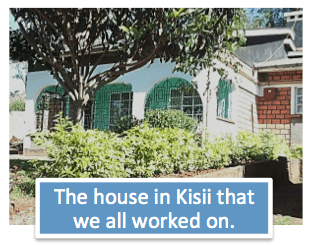 So we made plans to head to Kisii and work on a house that HEART had recently rented for a regional office and build a house for a lady that had recently lost hers to a fire. 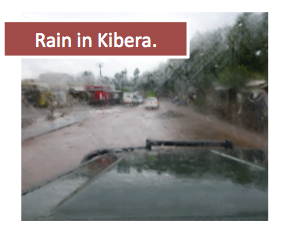 We arrived in Kisii to thunder storms and to find that electrical power is not all that reliable in that part of Kenya. Vickie Winkler, Bob Henderson and I set to work making dinner, (“American Hamburgers”) and just finished cooking the patties on the stove when the power went out. The stove is gas, the oven is electric. No problem. The potatoes got moved to the stove top and finished baking under aluminum foil. They have a saying there, TIA, (This is Africa). The African version of Hang Loose. So, twelve of us all enjoyed dinner by candle light. There was no hot running water so we washed dishes Kenyan style by boiling the water, using lots of soap, Clorox, and lots of rinsing. It all worked out. We worked on the house for three days installing new wiring, and washing machine, new plumbing on all the sinks, a new rock retaining wall in the back yard, new tile in the kitchen, and several other small projects. After the work on the Kisii house, we went to Kimera for a day to build a traditional mud house for a lady and her three daughters. They had recently lost their house in a fire. It was fun to see it all come together. With that it was time for a small break. 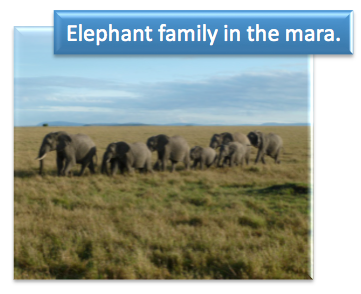 We headed to the Maasai Mara National Park for safari for a couple of days. We Met Bill Languemi in Narok, he had just arrived to join us for the last two weeks of November. From there we traveled to the mara. 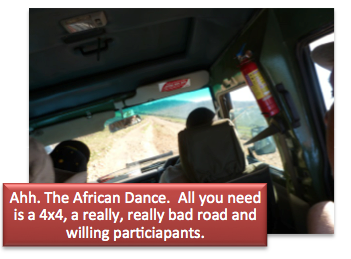 On the way we had the opportunity to experience a Kenyan Massage, (a very bad washboard road at high speed for about 40 miles) and some African Dance ( a true 4×4 road safari style at a little slower speed). Really, our driver Martin was outstanding and really knows how to handle a safari Land Cruiser. He is an experienced guide and was able to put us up close and personal to the Big 5 (elephant, rhino, lion, cheetah, and cape buffalo), and much more. 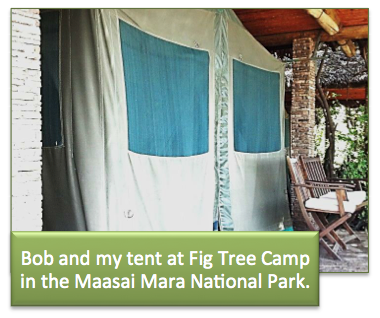 Vickie Winkler had made arrangements for us to stay at the Fig Tree Camp which was one of the first safari camps established in the mara. 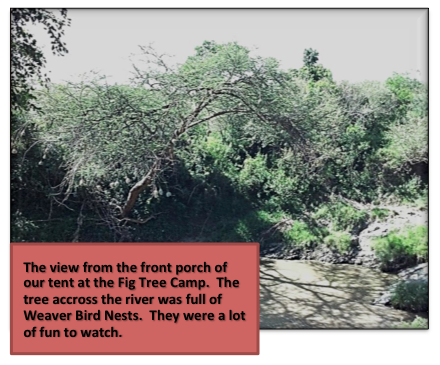 We were given the royal treatment with deluxe tents right on the river with, hippos, crocodiles, and real Maasai warriors right out the front door. We had a grand time. 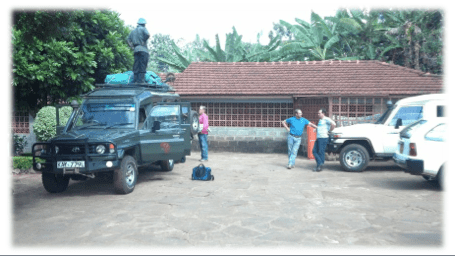 But, we had places to be and things to do so after a day and a half we were off to Nairobi where four of our team boarded a plane to head back home and three of us remained for the rest of the month. But before the team said goodbyes we all went to dinner at the Carnivore. Vickie and Martin joined us for a great feast. 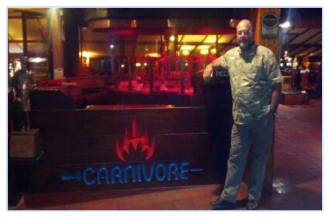 The Carnivore is on the top ten list of best restaurants in the world. What an experience. Mikuni’s is better in my opinion. 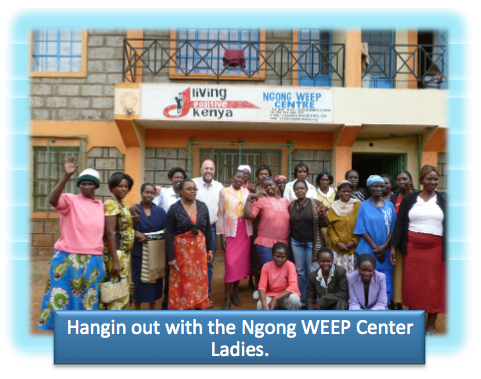 WEEP (Women’s Equality Empowerment Project) center there. It was neat to see the ladies sewing on treadle Singer sewing machines. They also made candles and cards and we had the privilege of sitting in on the Micro Finance members meeting. Two years ago these ladies had nothing and now with the right training they are on the verge of starting their own bank in Ngong. Back at the kitchen we did all we could do and then it was off to Kisii again for several more days work on the house that is the new regional office. We had to get it prepared for a grand opening on December 11th. There were going to be dignitaries from Israel at the grand opening including the Israeli Ambassador to Kenya. So things needed to work properly and look great too. We repainted most of the kitchen, did more electrical, put up shower curtains, with the help of the fundi we did more on the rock wall around the back of the house, and many small projects. 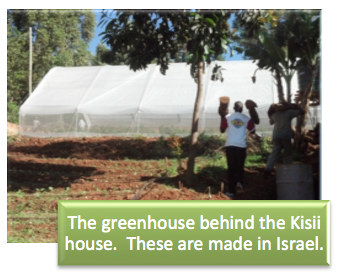 The house has a new greenhouse in the back yard which is made in Israel and the company who makes it has worked closely with HEART on a ministry to get greenhouses placed in the villages to help start sustainability and small businesses, raising and selling produce grown in the greenhouses. It has been quite a project and very successful. arrived back at the WEEP center just before I was finished. Martin found me and said “we have to leave NOW, its going to rain”. He was right. We no sooner packed things up and hopped in the truck and it rained. It rained bucket loads. The streets were like rivers in some places on the way back to the lodge. The windshield wipers could not keep up. This was our last day in Kenya. So Bill and I packed up in the afternoon. 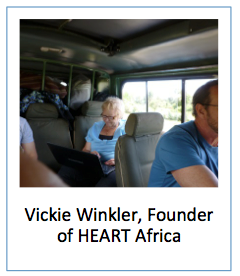 We left Nairobi at about 1:00 am that night and about 32 hours later arrived in Sacramento.